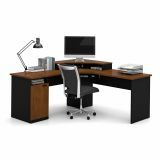 Bestar Hampton corner workstation in Tuscany Brown & Black - The Hampton collection is the perfect addition for your home office. This compact collection has been designed to maximize your work space and keep you organized. 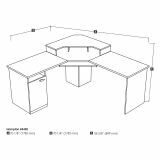 The Hampton corner workstation unit features a monitor shelf, open and close storage and a keyboard shelf on ball-bearing slides for smooth and quiet operation. 1” (25mm) work surface features deluxe shock resistant PVC edge. Also available in Sand Granite and Charcoal finish.